The most popular recipe I’ve ever had on my blog is my recipe for French Onion Pork Chops. It’s been amazing to see how many people have pinned and shared it around the internet. I knew French onion soup was a popular item, but I never expected that a pork chop recipe that incorporated that same soup would take off like it has. Naturally it’s only fitting that I bring you more what you’re craving when it comes to that classic French Onion Soup flavor, but with my Kudos Kitchen spin. I know you’re going to love this recipe. The flavors are complex and rich, but the recipe is relatively easy to put together, and it can be used as a party appetizer, main course, or even a side dish as needed. The key to achieving the deepest, richest flavors of a classic French onion soup is to take your time with caramelizing and developing the flavors of the onions. After the onions have cooked down and become transparent and golden, I added some beef stock and fresh thyme into the pan and allowed the onions to soak in all the lovely, rich, beefy flavor. 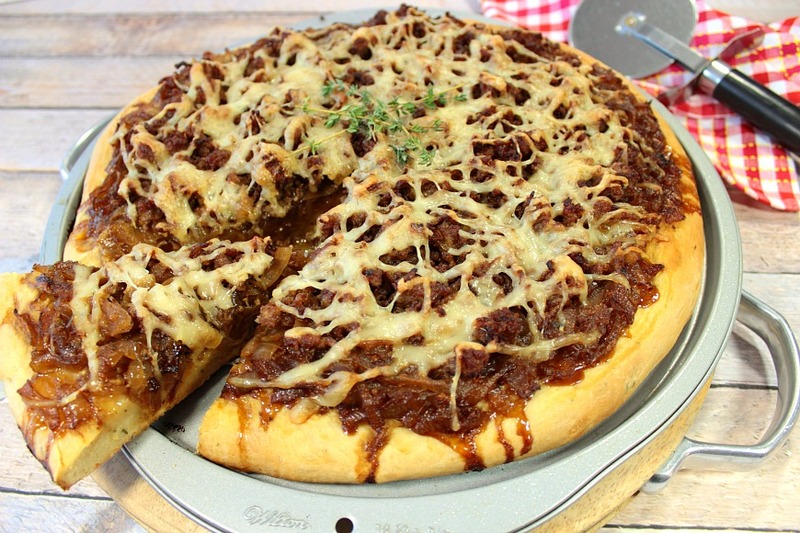 As a special note, if you don’t have the time to make your own crust for this French Onion Pizza, don’t let that stop you from making it. Feel free to use your favorite pre-made pizza crust from the market, or even use your favorite gluten free pizza crust. I promise I’ll never know, and remember, there are no rules. However, if you do have the time, I urge you to make your own crust with the beef broth and thyme. 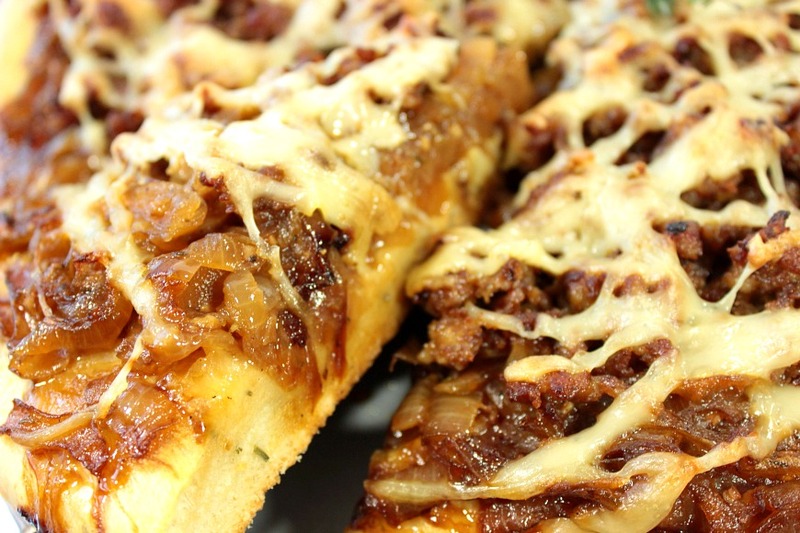 The flavors in the crust mimics the flavors in the onions, and will fill your senses with each and every heavenly, caramelized, oniony bite! -In a small bowl, dissolve the yeast in the warm beef broth. Stir in the sugar and allow the mixture to sit and get foamy (approximately 5 minutes). -In the bowl of a stand mixer with the dough hook, or a large bowl with a wooden spoon, Stir together the 5 cups flour, salt, thyme leaves and olive oil. Knead for 5-6 minutes in the stand mixer or bring the dough together with the wooden spoon. Turn the dough out onto a lightly floured surface and knead by hand until smooth and elastic. -Spray the inside of the bowl with olive oil and return the dough back into the bowl. Spray the top of the dough with additional olive oil spray and cover the bowl with plastic wrap. Place the bowl in a warm, draft free place until the dough has doubled in bulk (approximately 1 hour). -While the dough is rising, make the onions and brown the sausage. -In a large skillet over medium/high heat, cook the onions, stirring occasionally in the butter and olive oil. Sprinkle with salt and pepper. Continue cooking until the onions turn translucent and golden brown. Stir in the thyme leaves, beef stock, garlic and sugar. Lower heat to medium and continue cooking until the onions are deeply browned. Remove from heat and transfer the onions to a bowl. -In the same skillet, cook and brown the Italian sausage until no pink remains. Remove from heat and cool. -Turn the risen dough out onto a baking sheet or baking stone and press the dough out using your fingertips leaving dimples in the top of the dough. If the dough doesn’t yield well to being pressed larger, allow it to rest 5 minutes and then try again. Press the dough out to an approximate 1″ thickness. Place the pressed out dough in a warm, draft free place and allow it to double in bulk (approximately 1 hour). -In a small bowl, mix together the olive oil and Dijon mustard. Brush the mixture evenly and liberally over the risen dough. 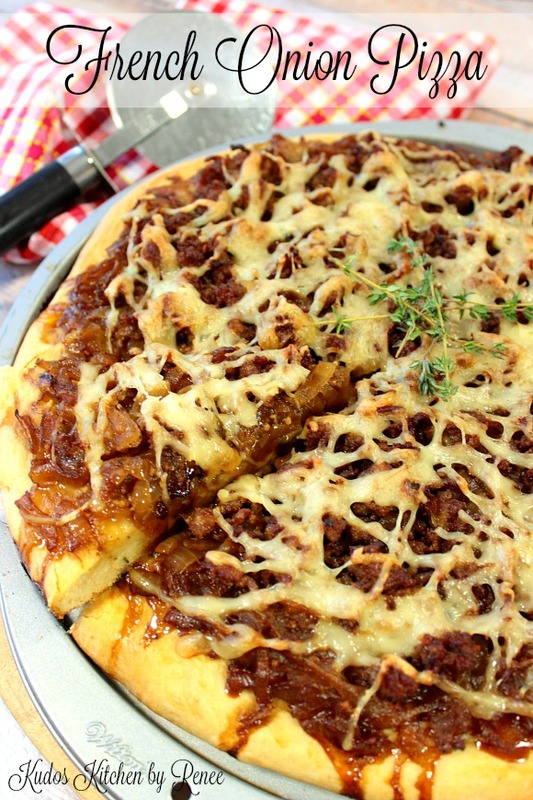 Top the dough evenly with the caramelized onions, cooked sausage and the shredded Swiss cheese. -Bake in a preheated oven for 50 minutes or until the dough is lightly golden brown. Cool slightly, cut, and serve warm. Open wide. You’re going to LOVE this pizza! I guarantee it!! If there is ever anything I can paint for you, from aprons and tea towels, to glassware items, please don’t hesitate to contact me or visit my shops on Etsy and Wazala. Custom orders are always welcome, and I will happily work and design from any photo or description you send my way. Kudos Kitchen by Renee ~ Where food, art, and fun collide each and every day! Oh my, I love this recipes, especially with suing beef broth in the dough. Nice! I would absolutely inhale this pizza! Such a great idea! Why have I never thought to do this? I mean, I pile as many croutons and cheese into my french onion soup as humanly possible. This is such a wonderful alternative!! oh wow! I'm going to have to make this for my mom! French onion is her favorite! 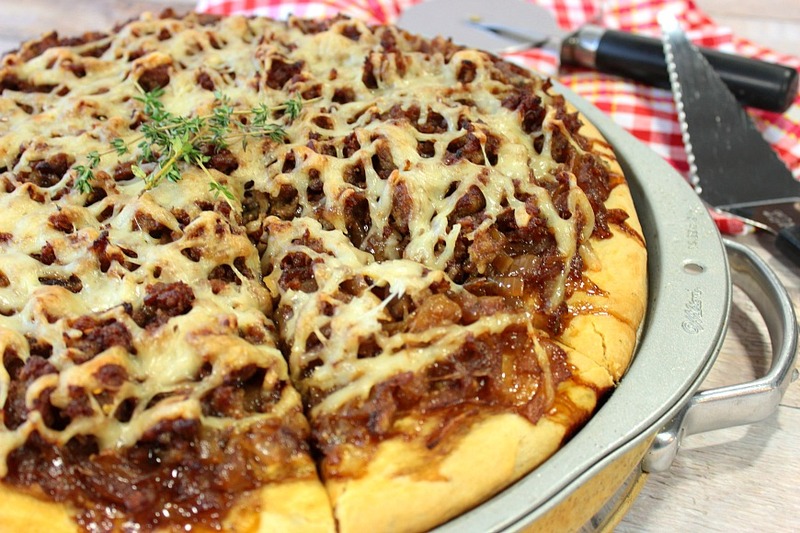 There is literally nothing better than caramelized onion and this pizza looks amazing! It's like the best part of French onion soup! Oh my goodness. This pizza looks ridiculously tasty. I must try this recipe! We love just about anything that has french onion flavors involved. This pizza looks incredible! Wow Renee – Two of my favorite meals combined into one! Such a great recipe – can't wait to try it at home! Homemade pizza is the bomb diggity and French Onion Pizza? Yes please. The apron is super adorable! You are so talented, Renee! I need to try this pizza idea! Looks crazy good! I could definitely go for a slice of that right now! 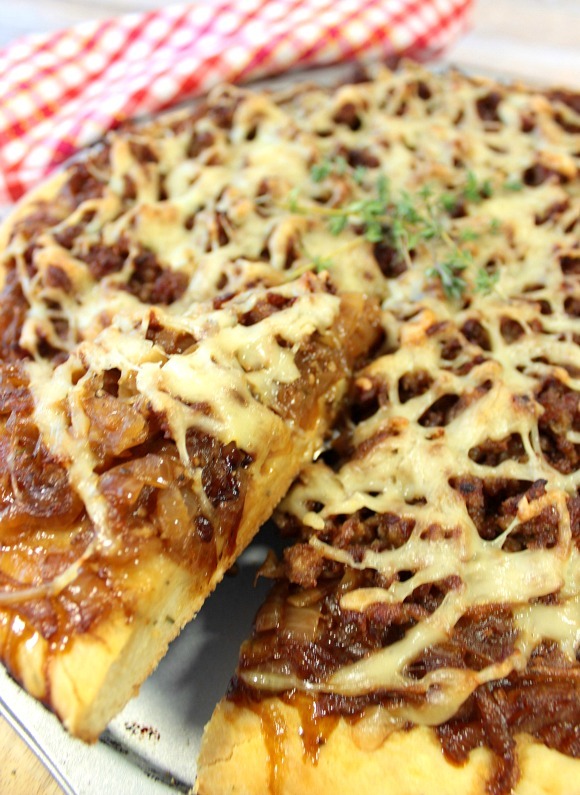 French onions…yum! Oh. My. Goodness – this looks incredible. What a fun idea, I would devour this! This is so fun and creative! My husband loves french onion and I really love that apron! This pizza is so fun and creative! I love hat apron too, you are so talented! In one of my cooking classes I took, caramelizing onions was homework. You have to be sooo patient but it's also so rewarding! I can only imaging how flavorful this pizza must be! I'd love to try this recipe! This is my favorite pizza idea by far. 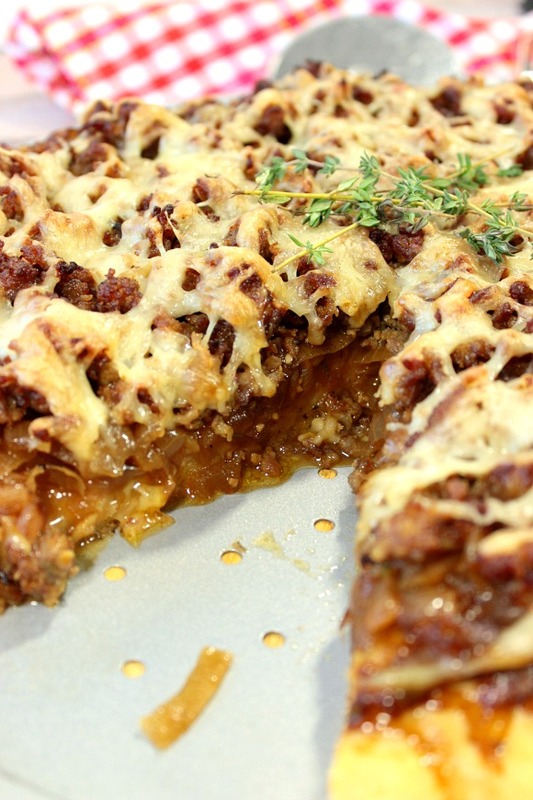 I am a sucker for french onion soup but french onion pizza – I am so in love! What a fantastic & delicious idea! Ok this is crazy original! 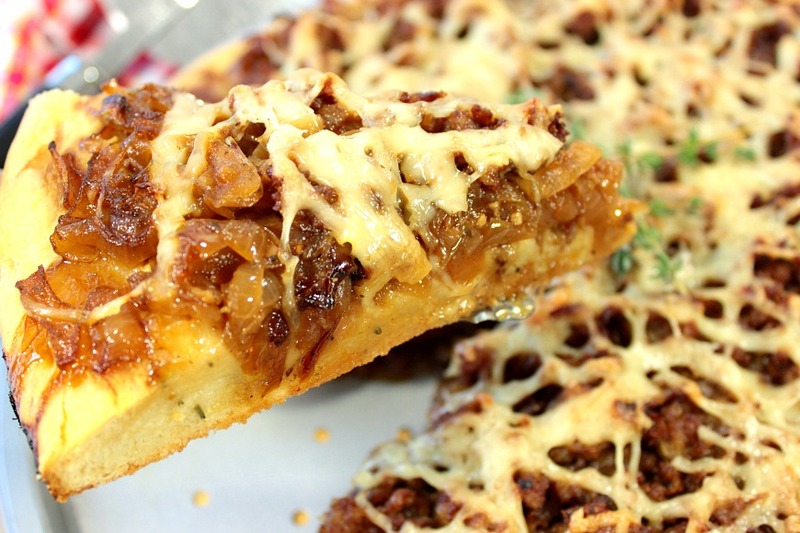 First I love French onion soup but in pizza form? SIGN ME UP! All of those onions probably smelled heaven when they cooked down….nom nom.